Switzerland’s Bölzer surprised the underworlds with last year’s debut Aura, which was released by Iron Bonehead (who else…). So it was quite satisfying to notice this band returning with a new EP, two-tracker Soma. Both tracks are an ode to the goddess Luna, by the way, ‘set amidst a thematic backdrop of war and the surrender of the fleshly temple’ (taken from Invictus Productions’ biography). Soma opens with Steppes (5:34), and this track grabs my by the bal… eh, by the throat as from the very first second! No, this isn’t just a bold statement; I truly mean it, for there is no reason at all to dislike such an introduction. As a matter of fact, this track is just a killer-one, redefining the purest essence of the most morbid Old School to proportions undefinable. How majestic! Steppes is as hypnotic as it is intriguing, with a constantly salvo on truly huge elements. This track is very varying and, at the same time, lovely coherent, combining melody with darkness, and craftsmanship with persuasion. Besides, the somewhat blackish atmosphere isn’t but a surplus, is it not?! The second composition, Labyrinthian Graves, clocks more than twelve minutes, and goes on in the very same vein. …which I am grateful for, evidently. 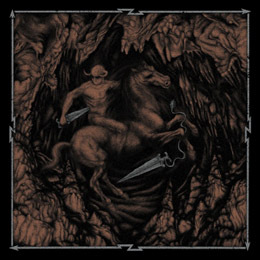 I do not know how Bölzer succeed to, but they are able to create a sound so mysterious, mystic and misty, and maintain a harnessing harshness without getting lost in their self-created web of diabolical and ominous creepiness. Notwithstanding a specific difference in execution, Bölzer’s stuff once again might be compared to the glorious supremacy of Ævangelist and the likes. And oh yes, that outro on the second track… What a psyche-transcendental journey! Fabulous!